December 7 update from DPW: Due to recent heavy rains and some snow, leaf collections are slightly behind schedule. DPW finished up Ward 2’s section D (contains Burleith) this week. This year’s fall leaf collection program runs from November 5 through January 19. Please rake your loose leaves into your tree box (or at the curb if there is no tree box) the Sunday before your scheduled collection week. Every street will have at least two scheduled collection weeks. DPW’s crews will only come once during each scheduled week. Please note that rain, snow, and ice storms will disrupt the collection schedule and cause delays. Did you know DPW collects nearly 7,000 tons of leaves each year? The 2018-19 Leaf Season brochure, which contains a welcome note, do's and don'ts, FAQs, and a schedule of pick-up of leaves, holiday trees, and greenery, was delivered by USPS at the beginning of November. Click here for a PDF version. Loose and bagged leaves placed in the tree box (or at the curb if there is no tree box) will be composted. Bagged leaves placed where your trash and recycling are collected will not be composted. Burleith is located in Ward 2’s D boundary area. Pick Up #2. Rake leaves out by Sunday, January 13. 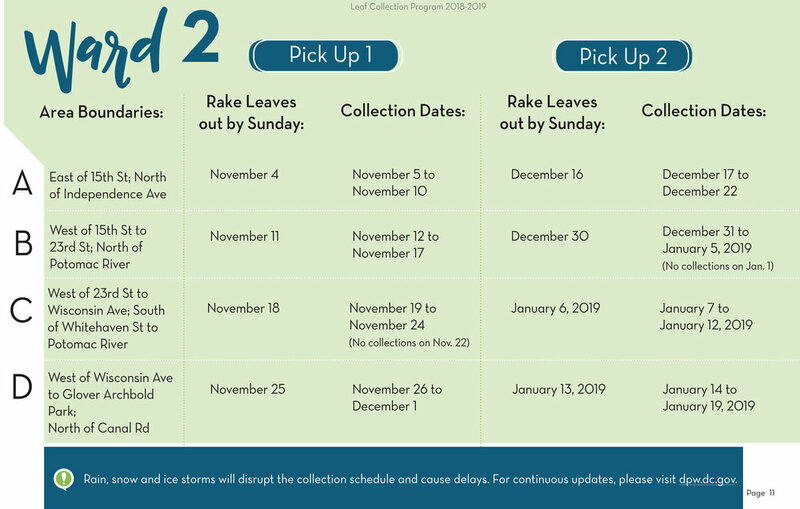 Leaves will be collected from January 14 to 19. Holiday trees and greenery will be collected citywide by DPW from January 14 to February 2. Trees should be set out for collection at the place where your trash and recyclables are normally picked up. Please remove all ornaments and lights and do not put the tree(s) and greenery in a bag. After February 2, place holiday trees and greenery where your trash is collected. They will be picked up with your trash as space in DPW trucks permits. DPW Leaf and Holiday Tree Collection web page. NEW: Register here to receive alerts about when DPW’s leaf collection crews will be coming through your neighborhood. Simply provide your address and contact info, and DPW will send you reminders about when to rake your leaves out via text message or email.